What is the School of Sound? 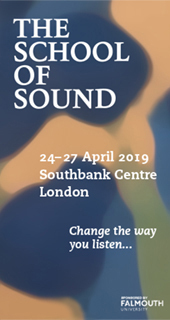 The School of Sound is a biennial symposium created to encourage a cross-disciplinary approach to using sound in the arts and media. We explore what sound does, and how audiences listen. It is a place where you can raise your awareness of audio production, how it conveys information and emotion, how you work with it. For four days you'll be immersed in a world of imagination, invention and innovation. Listening to presentations from a diversity of incredible talents, you will be able to disconnect from your day-to-day work, leave your comfort zone, and reflect on sound as something that is profoundly complex, entertaining and important. Why attend the School of Sound? The School of Sound is not an academic conference and it is not about how to get a job. It is a rare opportunity to hear and meet twenty creatives from the highest levels of the arts and media speaking in detail about how they think and work. And the School of Sound is not about just one area of sound production. The programme covers film, theatre, dance, opera, games, installation, music and radio - expanding your thinking and increasing your ability to practice across diverse genres and forms of production. At the School of Sound you will mix with hundreds of like-minded people - professional practitioners, educators, artists and students - with whom you can network, exchange ideas and create collaborations. The School of Sound is delighted to announce the first details of the 2017 programme. ... with more participants to be announced in the coming weeks. ethnography. The symposium explores memory’s resonances in shaping social space. Details and more events to be announced in the coming weeks. TICKETS: £10.00 – To purchase tickets, please click here. This seminar has been developed by Trudie Stephenson of The Art Insider to provide the skills necessary to navigate more effectively in the commercial art world. Many artists are daunted by the idea of public relations. PR is generally recognised as a vital part of the success of any endeavour or business venture and is a vital vehicle in attracting a gallery, buyers and positive reviews to you and your work. This seminar will show you how to market yourself and your work and how to implement and use PR strategies to your advantage. - How to document your work in different formats and the best way to send out to interested parties. This part of the workshop will explain the practicalities of organising an exhibition form A – Z. You will be guided through the processes involved, from the initial concept and research, through to agreements, layout and the display of artwork. You will also be advised on insurance, public liability and health and safety requirements. We will also cover how to implement effective sales strategies for your opening night and the duration of your exhibition. Please email info@griffingallery.co.uk for more information. Griffin Gallery will be hosting ‘Space for Creation’, a panel discussion about the impact of space on creation and artistic practice. We are particularly interested in having a conversation about the effect that studio space and residencies have on the artistic process, recognizing that a rural residency in another culture is a very different dynamic to an urban residency or a local opportunity. This is of particular interest to us since Griffin Gallery offers short term residencies to artists, international and UK based. Gordon Cheung, one of this year’s Griffin Art Prize judges, Evy Jokhova, a former resident artist at Florence Trust and current GAP shortlisted artist, Alzbeta Jaresova, Griffin Art Prize winner 2012, as well as Luke George and Elizabeth Rose, GAP 2013 winners, are all members of the panel. The first Biennial PARSE conference at the Faculty of Fine, Applied and Performing Arts, University of Gothenburg, Sweden takes as its point of departure the question of time. Time arguably has always been at the center of the research initiatives of the natural sciences, of philosophy and of the many different practices of history and social criticism. However, time also occupies a central place for the curiosity and attention of artist researchers across all the arts. The intensification of the question of time has, in recent years, prompted some to speak of a "temporal turn" across the disciplines. This conference seeks to bring together a range of researchers, drawn mainly from the artistic fields but also inviting researchers from across all disciplines to consider questions with respect to the practices, processes and perturbations of time. We are especially interested in contributions that critically reflect upon, and/or in some way work to modify the familiar conventions of the academic paper, the panel discussion and the artist's talk. The deadline for proposals is March 1, however, we recommend early submission. Proposals should be sent to parse@konst.gu.se. – an indication of technical or other requirements for the contribution/presentation. – Artists' presentations, papers and readings: 20 minutes. (We are aware that some artists' presentations could require more time. Please indicate if this is the case). – For artistic interventions, performances, public actions and screenings, please indicate the duration proposed suggestion. Proposals will be peer-reviewed by a panel that includes The PARSE advisory & Journal editorial boards, and the PARSE working group. 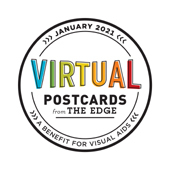 Each proposal will be reviewed by three members drawn from the panel with reference to relevance to the overarching thematics of time, potential in developing a dialogue across the disciplines, and originality of contribution. A selection of contributions will be further developed for publication through the PARSE Journal in consultation with, and by permission of, the authors. On Landscape # 1 seeks to instigate a series of discussions, raise questions and incite debate on representations of landscape. A central element of the project will consist of an open call for self-published, handmade or short run books relating to the exhibition framework. The publications, on display throughout the exhibition, will provide a platform for wider debates around landscape whilst presenting an opportunity for emerging practitioners to showcase their work. Open to all and free to enter, the only criteria is that each book relates to the theme of the 'On Landscape #1' project.